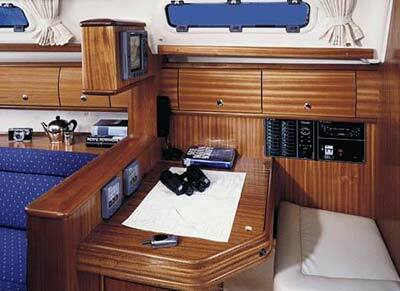 The sailing performance and well designed interior of the Bavaria 36 is impressive. The salon and cabins offer amble light, space, ventilation and storage, whilst the well designed hull, offers superb sailing. 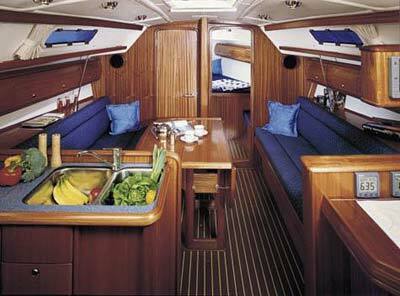 The interior of the Bavaria 36 is designed with space and comfort in mind. There are three double cabins -one forward and two aft. The main head is aft, which has a hot and cold water shower. There is a second shower located on the swimming platform. 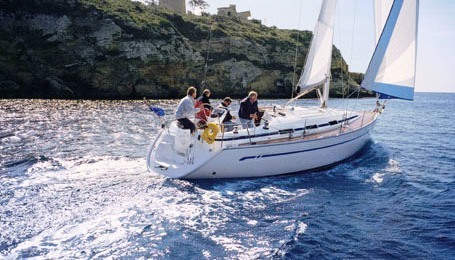 The Bavaria 36 has a mailsail with lazyjacks, furling genoa,one wheel steering and a electric anchor winch. There is swimming platform and ladder, a bimini and dodger shading the companionway, an ondeck shower and BBQ,AM/FM radio & CD player, fully equipped galley with LPG stove & oven, fridge/freezer, pre-charter cruising guides, full boat and chart briefing. Optionals include a skipper or a provisioning service.